Micro Roni Stab Review: Best Glock Conversion on the Market? If you’ve ever looked into Glock conversions or stabilizers, you’ve probably seen the same options I have…and been a little unimpressed. I’ve tried a large number of these types of things, and the best option I’ve come across has always been the MechTech Glock Carbine Conversion, which is alright, but I don’t love it enough to recommend it to anyone. In fact, my recommendation has usually been to just build yourself an AR in a pistol caliber chambering with something like a 9mm Glock-compatible lower ($139.00). That was until I opened a little box from Israel containing a CAA Micro Roni Stabilizer Brace. Sling and sights not included. Disclosure: YRS Inc sent me this for free, but please don’t think that has in anyway colored my opinion of the product. Make no mistake, I realllllly like this thing, but that has nothing to do with the price, or lack thereof. In fact, in just a minute, you’ll see how little my getting one for free mattered in the end. So, what makes this thing so great? Well, that’s kind of a long story. The Micro Roni Stab is something of a hybrid between a Sig-style Pistol Brace and a true carbine conversion like the one from MechTech. Instead of taking the slide off like you do with the MechTech, you just attach the charging handle to the rear slide serrations, slide the pistol (in my case a Glock 19, but there are a host of options available) into the brace, and lock the latch at the rear. It’s all very simple, and while I wouldn’t want to have to do it quickly, its definitely easier than some of the other carbine conversions out there. Best of all, you don’t have to disassemble the pistol at all, and you maintain all the same access to the controls that you’d normally have. To remove the pistol, you press down on two tabs on the front of the stabilizer, and press a button to release the rear locking latch, and then you just slide the pistol out. The latches on the front are pretty similar to the disassembly latches on Glocks…slide down and then youre good to go. From there, just wiggle the charging handle off the rear of the gun, and you’re back to your standard carry piece. Everything locks together firmly with nice audible and tactile clicks that leave no doubt about whether or not the pistol is properly seated. After a few repetitions, I was able to perform the process quickly and easily, even in the dark. Once the pistol is latched in, there is virtually no wiggle or “give” and everything feels very solid. The Micro Roni is also equipped with a folding stock that allows you to transport it a little easier, but it doesn’t really work well if you want to shoot it with the stock folded. I don’t really see a way for the design to be changed to allow you to shoot it normally with the stock folded, but it did annoy me a little, even if it ultimately doesn’t make much difference. 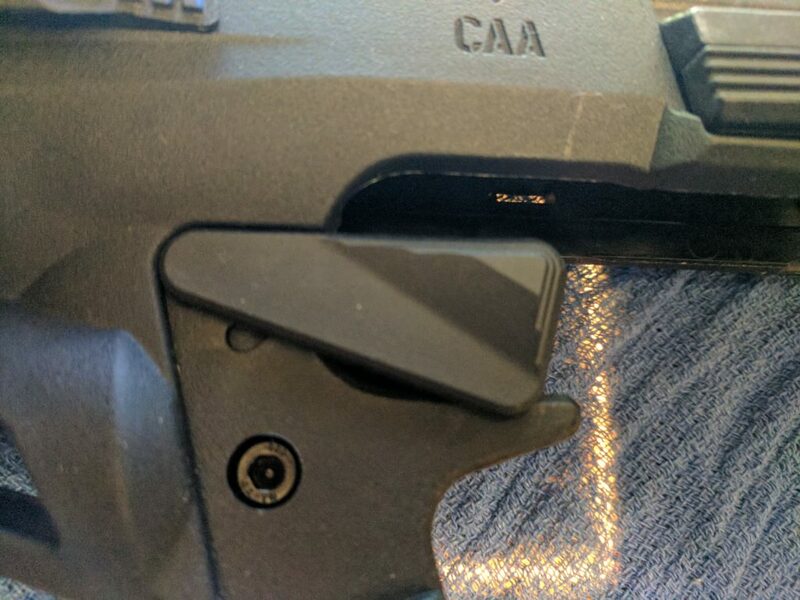 There is also a “safety” of sorts in the form of a little flap that you can push over to cover the trigger on both sides. I’d like to see a version with either a locking flap, or maybe one that’s a little stiffer, but I probably will never, ever use it anyway so it’s not a big deal for me. 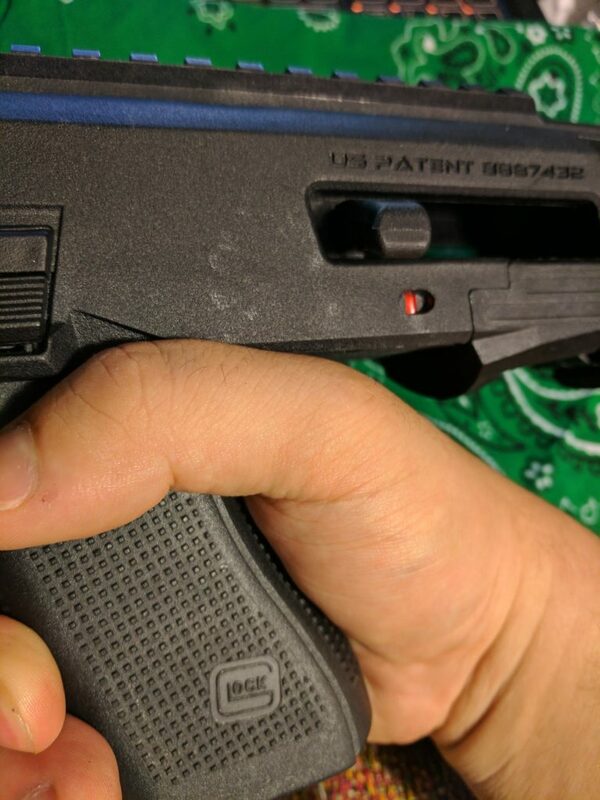 I figure about 90% of you have never wanted a Glock safety, but here’s one if you’re into that sorta thing. The Micro Roni is made with an aluminum spine that houses the locking mechanism, surrounded by a high-density polymer that feels almost identical to the polymer used in Glock frames. The polymer frame has shown no signs of wear after a few hundred rounds, and several days of being thrown around in my range duffel. Its also survived getting knocked off a loading table, and tossed into the dirt at my local range. While I wouldn’t recommend doing that with yours, mine survived just fine. In fact, the only thing that I really didn’t care for in the construction was the lack of a metal hinge for the folding stock, and the use of polymer for some of the locking surfaces, but again this is kind of a minor niggle. Nothing about the construction makes me think any of these parts are likely to fail, but I know me. I know how rough I am on gear. 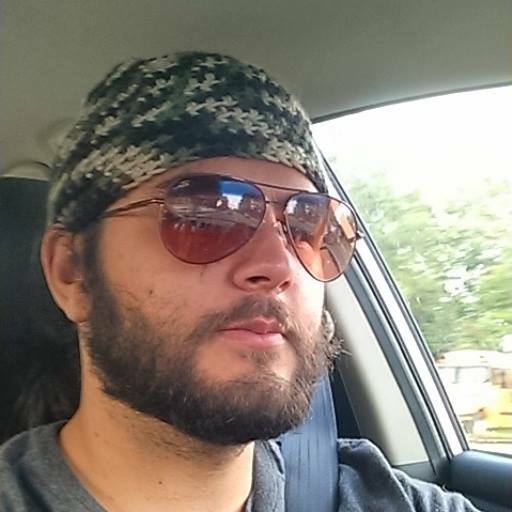 One of my range buddies likes to joke that I was cursed by a gypsy, my fiance thinks I’m part Neanderthal. I’m not sure either of them are wrong. 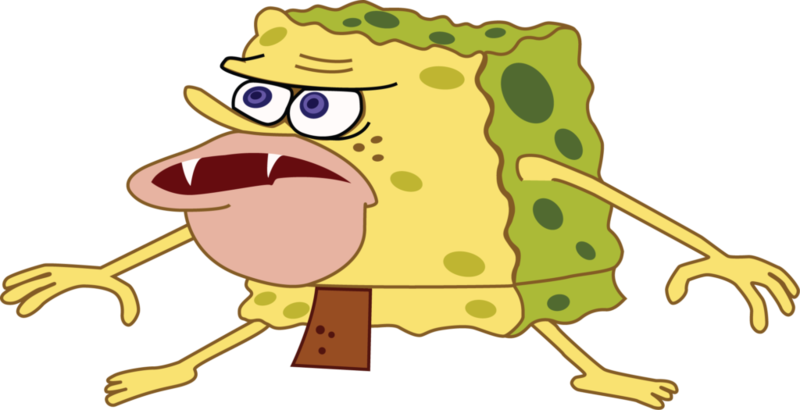 Actual picture of me around anything breakable. Point is, if it can break, I assume it will break, and plastic makes me nervous, even if it shouldn’t. 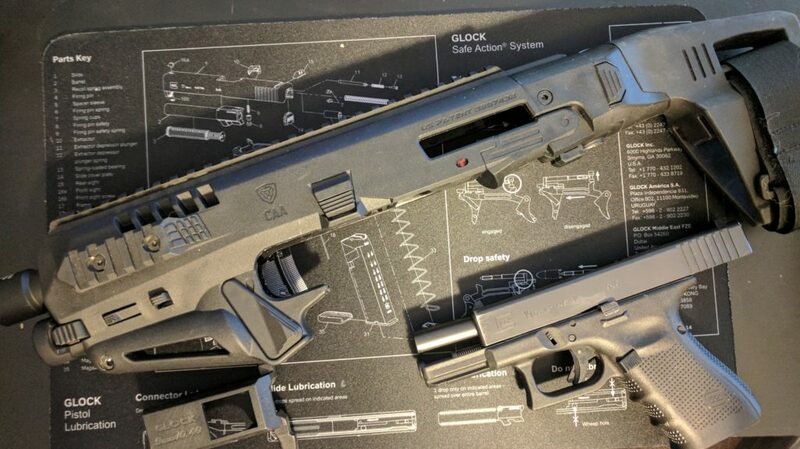 It was a long time before I got on the Glock hype train (though I am now all aboard on that score) and I expect it will be a bit before I’m fully on-board with a polymer carbine conversion. In fairness, I don’t care for polymer AR-15 lowers or kydex holsters either, so feel free to ignore me on this one. If you want to add more functionality (or in my case, more things to break) there is a full-length 1913 rail on top, with removable sections of rail on either side of the fore-end where you can slap lights, lasers, coffee grinders, and even CAA’s super-cool thumbrests made specifically for the Roni that I really like the look of, but haven’t tested out *hint hint hint YRS Inc*. Honestly, I’m not 100% sure how much of a difference it would make, but it looks cool, and I want it. Which is a perfectly reasonable position when it comes to gun stuff. So, the whole point of this thing is to help you shoot better. To do that, step one is to improve on the ergonomics of your handgun…making it easier to hold, aim, control under fire, etc. Admittedly, aiming to improve the ergonomics of a brick isn’t exactly a lofty goal. Well, first off, the simple fact that you get a stock or a brace (depending on whether you shoulder it, or use it as an actual brace) and room to grip the fore-end like a dedicated carbine makes it much easier to shoot and do so accurately. 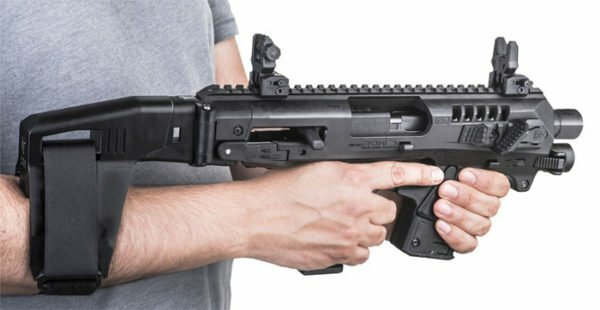 Overall, the Micro Roni Stab is a good half-way point between a true PDW or pistol caliber carbine like the CZ Scorpion EVO ($989.00) and just using the handgun on its own. With the stock unfolded, the Micro Roni is right at 18″ long, making it a little on short side for a PDW, but its still a good size where I could see anyone from police officers to folks on executive protection detail being able to move easily in and out of vehicles and other tight spaces. Personally, I had a grand time chasing imaginary intruders around my house (with the gun very unloaded with a chamber flag in) and could definitely see it being used for indoor work, as well as for occasions where you need a little more range outdoors. The Roni brace is comfortable to use, whether you have it shouldered or if used as an actual brace. I expected to feel like my hands were a little cramped on the small-ish carbine conversion, but it really isn’t bad. 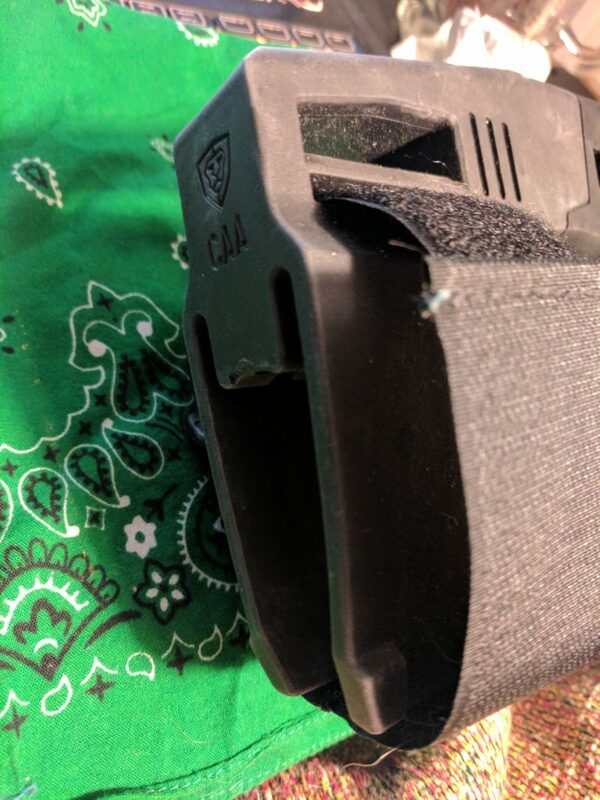 Legality forbids a vertical foregrip without NFA paperwork, but even so I had no problem gripping the front of the brace during long periods of rapid-fire. There is a version of the Micro Roni that comes with a magazine holder up front that doubles as a grip, but the Micro Roni Stab that I tested was just fine. My biggest issue with the Micro Roni was actually an ergonomic one…and it was also easily fixed. The edges of the frame that lie just above where your shooting hand rests are kinda sharp out of the box. I ended up with a little bit of irritation on my hand near the web between my thumb and trigger finger, right about where you would expect slidebite on say, a 1911 if you grip too high on the beavertail. I’m a fairly handy fellow, and I mod almost all my guns. I possess great swathes of sandpaper, and many, many files. About two seconds with a file, and 15 seconds with some sand paper fixed the problem, and I would be highly surprised if anyone noticed I’d done anything to the area at all, unless they had another Micro Roni to compare it to. I happen to have a spare lying around for reasons I’ll discuss later, and mine feels much smoother and no longer rubs the skin off the back of my hand. Problem solved. My hand no longer hurts, things are good. Here’s the big one…how much does it actually improve accuracy? I’d heard good things, and it immediately felt like it would improve accuracy, but obviously I have to test things for myself. To put the Micro Roni through its paces, I slapped a spare Bushnell TRS Red Dot on it (my preferred cheapo red dot) and went to the range. Everybody has their own way of doing accuracy testing. Your way might be better than mine. I try to do things as fairly as possible. I started with a box of ammo I know my Glock likes: Remington Golden Saber 147gr BJHP ($25.00). From there, I wanted to test accuracy under a variety of different conditions. I wanted to try the Micro Roni shouldered vs used as a brace vs freehand shooting vs shooting off a bag. Then, for shiggles and gits, I decided to break the freehand category into shooting one handed and shooting two handed. Here’s what I found. So, looking at my sciency-ish data, here’s what I learned…it works! My groups with the brace shouldered were basically on par with the groups I had shooting off a bag, which surprised me. I was a little disappointed that my groups with the Roni used as an actual brace weren’t better, but that may just be my general awkwardness using it that way. I don’t have a huge amount of experience shooting with a Sig-style brace, and I feel like that may have affected my accuracy a little. That being said, the brace still performed a bit better than I shot two-handed which is what you would hope would be the case. I also handed it off to a buddy with much more experience using braces like this, and his group was much tighter than mine…almost a full inch. 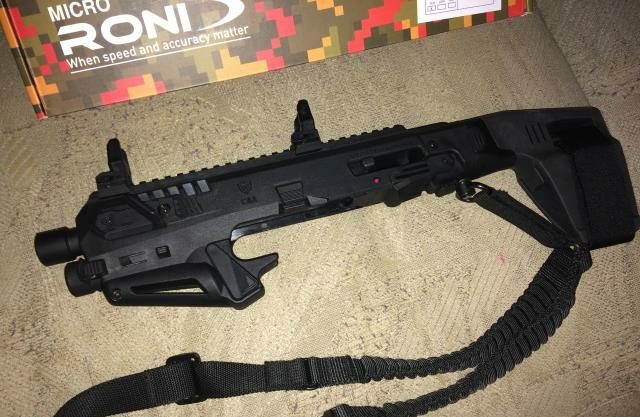 All in all, I was very pleased with the extra accuracy I got out of the Micro Roni Brace…so much so that I actually got in touch with YRS Inc and purchased one for myself. Well actually, I purchased the Micro Roni that YRS Inc sent me for review, at a discount. That review Micro Roni is currently sitting in my “Things Have Gone Wrong” SHTF bag under my bed, waiting for the apocalypse, or for my next range trip. I really do like this thing, guys. 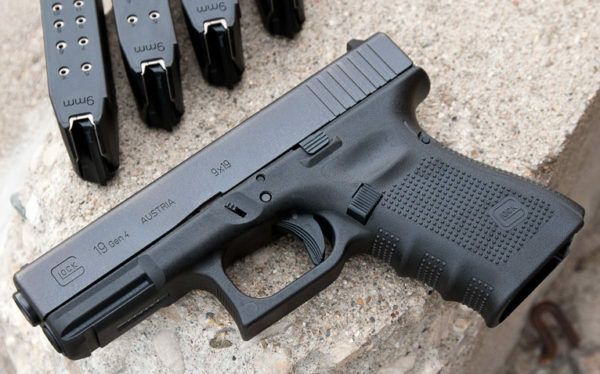 If you have a Glock, I strongly recommend picking one up. So, the Micro Roni improves ergonimics, boosts accuracy, and looks damn cool. Its not perfect, but its certainly worth picking up if you are looking for a rugged, affordable Glock carbine conversion. I trust it enough that I’d use it to defend my home and loved ones. I can’t give a higher endorsement than that. So, what do you think of the Micro Roni? Do you want one? Excited for the giveaway? Let us know in the comments below! I’m all in on the Micro Roni!!!! Where I aim, I hit!!!! Not just using a RGB dot either, If i only use iron sites – still dead on target. Using a Glock 32 and a 9mm conversion barrel – along with the native 357 sig!!!! My friends that had rifles thought that this was just a toy….until they shot it!!!! Now they’re getting Roni’s as well! A gun range is thinking about getting one for rental!!!!! I shot a Glock 18 a few weeks ago in a Roni and it was so much fun I just ordered one for my 17. I’m still of the opinion the mechtech is the way to go. 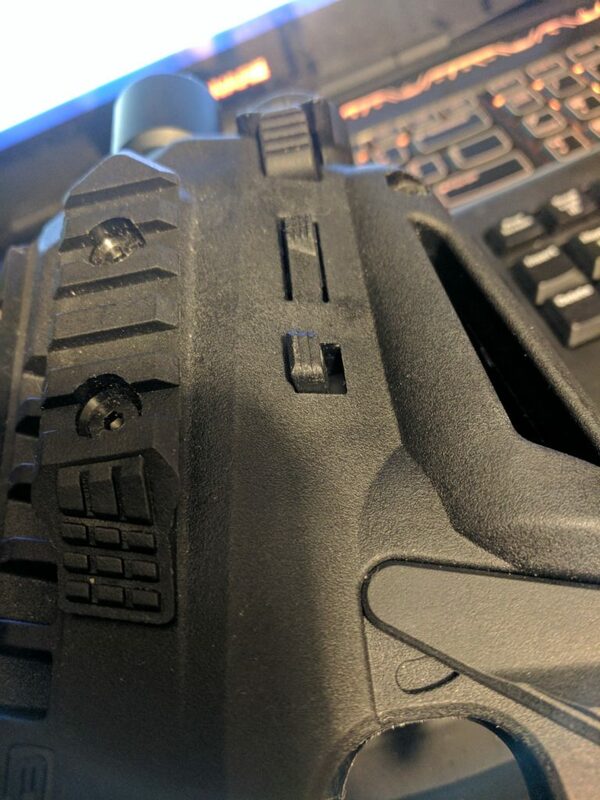 Complete glock lowers are available for $75-$125 so you can get the ccu for $500 shipped. So your looking at a $650 dedicated glock carbine and still keep your glock at your side.